Billing is one of the most crucial aspects of any physical therapy practice, apart from taking care of the patients. If your physical therapy practice is devoid of a streamlined billing system, it can affect your workflow, decrease your profitability, and add chaos to your practice. Though billing system is a challenging part of your practice, with an efficient system in place, you can invest your valuable time in the task you value most – patient care. Integrated billing system: Complete integrated billing system streamlines all existing data and decreases any scope of duplicate and repetitive work. With an integrated billing system, you never have to re-input CPT codes, appointment information, or key information about patients. All necessary data flow in the predetermined flowchart into the precise templates, making the entire process simple, more efficient, and less tedious. Faster claims: The profitability of your practice depends on how fast you can process the claims. With our one-click submissions, the timeframe of the claim acceptance decreases, leading you to save valuable time and resources. The software helps to handle unpaid claims and billable amounts in a more sophisticated manner and immediately notifies when a claim is approved or rejected. Latest news: For quicker acceptance of claims, it is crucial that your software remains updated with all the latest changes and rules. Enabled with SAAS, we ensure that your billing process remains updated with all the latest changes in insurance provider policies, letting you receive your claims in the quickest manner possible. Being at the forefront of the technology, the software ensures that you face fewer rejections of claims due to flawed paperwork. Patient Invoicing: With automated invoicing process, it is now possible to send the invoices directly to the employers, insurance companies, patients, and bulk bills. The software also allows your bills to be saved in PDF format for maintaining the patient records. Statements of patients: Due to the automated system, creating and maintaining patient records has never been more simple or quick. 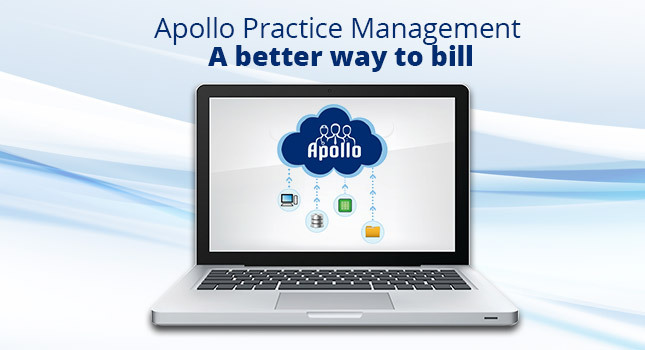 Apollo practice Management makes it simple to create statements with all the billing details you will need to maintain while complying with HIPAA norms. Also, it becomes simple to locate payment records with patient balances. Seamless switch: Unlike other physical therapy practice management software’s, Apollo practice management lets you integrate with any clearing house your prefer. You can retain your current business relationship with a clearing house, thus less lag and trouble when switching to the new software. Customization: We understand that the needs and requirements of each practice are unique. With our customizable invoicing, you can develop simple templates that adapt to your unique requirement. It gives you the option to let you bill the way you require. Physical therapy billing software is designed to let PTs spend less time with paperwork and spend valuable time on taking care of your patients. An efficient SaaS-based billing software is one of many successful results of using Apollo Practice Management. It helps you to decrease the high costs and resource locked-in to keep the billing process operational. We are committed to getting your rightful earnings through a robust billing process with the least involvement from your side. Interested in learning more about the Apollo Practice Management software? – Contact us today.